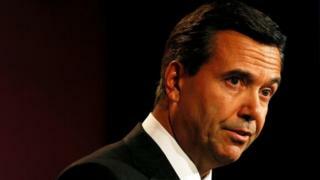 The boss of Lloyds Banking Group has given up his lucrative final salary pension after mounting pressure over the perk. Antonio Horta-Osorio was the only employee entitled to such a pension, having overseen the ending of final salary schemes in 2014. Staff had criticised his arrangement, and there was talk it could overshadow Lloyds' annual shareholder meeting. But the banking giant insisted it was entirely Mr Horta-Osorio's decision. The chief executive's own arrangement dates back to a pension he forfeited when he took over at the banking giant after leaving Santander in 2011. The Investment Association, a big city trade body for UK investors, has been pressing companies to crack down on excessive executive pensions, arguing that they are against the interests of shareholders and staff. Lloyds said in a statement on Tuesday that the change is "in line with the Investment Association guidelines for a gradual reduction in pension allowances for current executives". The change takes place immediately, Lloyds said. Banking rival HSBC has already changed the pension terms for its executives. A Lloyds staff group called Affinity had written to the Investment Association saying that Mr Horta-Osorio's pension arrangements had been "of massive discontent". It was expected that the association would review the scheme ahead of Lloyds' annual meeting on 16 May, when shareholders have the opportunity to publicly comment on pension arrangements. Lloyds staff who are members of the defined benefit scheme had their pensionable pay capped in 2014. The bank said that at that time Mr Horta-Osorio had a capped base salary of £1.22m, which was used to determine his benefits. The result was that under his retirement scheme his benefits would not increase. Mr Horta-Osorio's salary only increased from the capped base figure for the first time in 2018, Lloyds said.